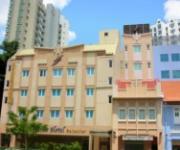 This city hotel is part of a chain of budget establishments in Singapore. This 6-floor hotel comprises a total of 68 rooms featuring basic amenities. The hotel does not have a pool, fitness centre or a restaurant, but does offer guests a fax service and 24-hour security surveillance for all public areas. Other facilities offered to guests at this air-conditioned hotel include a lobby area with a 24-hour reception and lift access, as well as a laundry service (charges apply).